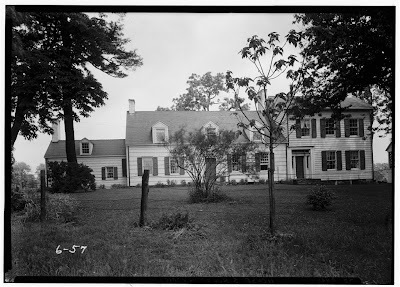 A Dutch Farmstead in South Bound Brook ~ The History Girl! Northern and central New Jersey have a rich Dutch heritage. The Dutch were among the first to establish colonies in New York and New Jersey. The Dutch began settling in the Raritan Valley in the mid to late-1600s. Another wave of settlement occurred between 1720 and 1740 around the area of Raritan Landing in Piscataway. The settlers' heritage was evident in their construction methods, religious services, and family traditions. Despite their eventual assimilation, this strong Dutch heritage is still present in remaining historical sites, street names, and families that call New Jersey home. The Staats Homestead in South Bound Brook is one example of a successful agrarian Dutch family, steeped in tradition, and whose homestead remained in the ownership of descendants of the family for over 200 years. A flood of Dutch settlers entered the Raritan Valley between 1720 and 1740. Somerset County and the New Brunswick area were heavily influenced by the Dutch. The abundant fertile farm land, easy access to trade routes, and the Raritan River contributed to the areas settlement. In 1738, Peter Staats purchased 305 acres of land from Cornelia Van Dam of New York. There is some belief that a home stood on the property, though in what form, no one is quite sure. Two years later, on April 20, 1740, the property was passed onto Hendrick Staats, for the sum of five shillings. By 1745, Hendrick is listed on the Franklin tax records as a landowner with 250 acres and ten cattle. In 1769, Hendrick gave it to his brother John Staats. Almost immediately, most likely as a gift, John Staats gave the property to his recently married son Abraham and his new wife Margaret DuBois in 1770. Abraham Staats was born in Hillsborough Township on May 25, 1743. He married Margaret DuBois on November 8, 1770. Besides farming, Staats was a surveyor, and taught surveying, navigating, and mathematics. He was an active patriot and was very involved in local revolutionary efforts. He and Margaret had six children; Isaac, Margaret, Mary, Sarah, Phebe, and Jane. The original section of the Staat's home, as it is today, is believed to have been built circa 1740, yet tree-ring dating has provided the year 1722 on select pieces of wood in the home, which roughly corresponds to when Cornelia Van Dam acquired the property. There is disagreement as to whether the home dates to the 1720s or 1740s, although often wood from earlier structures was reused in new construction, which may account for the earlier pieces. The original home was two-rooms deep and would have had a sleeping loft in the attic, accessible by a winder-staircase. Corner fireplaces were constructed and would have provided warmth for the family during the winter season. A view of the Staats House in 1936. That Staats' farmstead was an important location during the second Middlebrook encampment of 1779. Abraham Staats was a fierce revolutionary. He and his neighbor, Hendrik Fisher, were not offered amnesty that the Brisith offered to other rebels in the colonies. He was considered an "arch traitor" for reasons unknown, however local legends suggest that Abraham was involved in a spy network and that his slave, nicknamed Tory Jack, may have spied on the British in nearby New Brunswick. When the British occupied New Brunswick, Staats and his wife hid valuables in the floor of his barn. In April of 1777, the farmstead was raided by British troops. The troops stole a cow, five calves, and clothing. In March of 1779, the family was finally able to live more comfortably and without fear when the inspector general of the Revolutionary army, Baron von Steuben, was quartered at their home. Von Steuben remained at the Staats' farm until June of 1779. While staying with the Staats, von Steuben occupied the two first-floor parlors of the house and his staff was positioned in the orchard behind the house. George and Martha Washington frequented the house, along with other generals. Of particular interest in the house is a corner cabinet, which is believed to be original to the home. It is said that Martha Washington greatly admired the cabinet and referenced it in a letter to friends during her stay. Corner cabinet that Martha Washington admired. Von Steuben was stationed in South Bound Brook for the purpose of training between eight and ten thousand men. In May of 1779, von Steuben conducted a ceremonial review of the troops in honor of General Washington, the French minister, M. Girard and the Spanish emissary, Don Juan de Miralles. The minister was accompanied by roughly sixty officers, including Generals Washington, Knox, and Greene, Baron Johannes DeKalb, William Alexander Lord Sterling and Washington’s aides Alexander Hamilton and Tench Tilghman. Following the review, a reception was held in Staats' orchard for the visiting French minister. After the Revolution, Abraham served as an appraiser, adjusting claims for property losses Americans suffered in the county during the Revolution. In 1792, Abraham Staats became the tax collector for Somerset County, a position he held until 1820. All of Abraham's pursuits, including farming, were successful, causing him to accumulate a great deal of wealth which allowed him to send his daughters to finishing school in Philadelphia rather than a local academy. By 1800 the home was becoming too small and with the birth of Isaac in 1791, an addition was sorely needed for a family of eight and their five slaves who labored as domestic servants and farm hands. The new addition contained a dwelling room, a rear bed chamber, and a spacious kitchen wing. Abraham Staats died in 1821. In his will he left half of his farm, which at that time was one hundred and thirty acres, to his son, and the other half to his five daughters. "Bequeath to my son Isaac Staats the one half of my farm and plantation ... Provided that my daughters that may be single at the time shall occupy (the farm) for their use only. One half of my dwelling house and garden. One third of my other buildings. One third of the fruit of my orchard." At some point between 1820 and 1825, Abraham's son Isaac put a large two-story Greek Revival addition on the home, allowing him to have a private section of the home, separate from his sisters who were staying at the farm. The money to construct this addition is believed to have been garnered in part by selling property along the Raritan River for the construction of the Delaware and Raritan Canal. Dining room of the Greek Revival addition. By 1825, Isaac's share of the property was purchased by his sisters and Isaac moved to West Virginia. Over the next few years, property was sold. One piece was either sold or given to David Mack. A second tract was sold to R. H. Freeman, who may have been related to the Staats family. The Somerset saw mill was also located on a portion of the property, but the main house remained in the possession of the four sisters. Four of the five sisters died without leaving heirs. Each sister left their share of the real estate to Sarah's daughter Margaret Ann who married Cornelius Wyckoff LaTourette. A deed transfer was recorded in 1877 between John Van Dike and Margaret Ann LaTourette. John Van Dike's relationship with the Staats House is unknown. The Staats house is said to have been in continual possession of the Staats heirs until 1935 when Eugene LaTourette sold the house to R. J. Riddell. Some historians speculate that the deeds concerning Margaret and John Van Dike involved a mortgage or other parcels of land sold off after 1825. Once the house was sold in 1935, ownership changed hands three times in a period of twenty-two years. R. J. Riddell owned the house until 1938, when he sold it to Amy Bassett. Amy and Prentiss Bassett sold the house in 1946 to Charles C. Hollister. Charles C. Hollister sold the house to Walter Bielicky in 1957. In the early 1960s, Bielicky also bought David Mack's lot and the lot belonging to the Somerset saw mill. The Borough of South Bound Brook acquired the Staats House in 1999 from Bielicky. The property was entered onto the National and New Jersey Registers of Historic Places in 2002. On the property a few outbuildings original to the property remain. The stone foundation of a large barn is located behind the house in addition to a restored corn crib and smokehouse. Today, the Abraham Staats House has been restored and continually evolves as more of its history is discovered through primary document research and archaeological investigations. The Staats House remains important for its use during the Revolutionary War but also needs to be recognized for its cultural and historical fabric as one of a handful of remaining early Dutch agrarian homesteads in the Raritan Valley. Thank for for the detailed and interesting history! The house is open for tours during the annual re-enactment of the Battle of Bound Brook every April. Visit the web site for details.